Check our stores for low MIELE prices! everyday messes - like kids tracking in dirt, pets leaving their hair everywhere or dust bunnies that seem to appear out of nowhere - the Miele canisters can handle it! Choose from models that included a motorized power nozzle for deep cleaning carpet, or suction models that feature either a turbine-driven nozzle for low nap rugs or a suction only nozzle for surface rug cleaning. All models will take care of your floors, plus include attachments for furniture, dusting and crevices. We invite you to come try one out...at your exclusive Miele dealer - Capital Vacuum. The Best Quality Vacuums In The Triangle...Since 1953! Free Demonstration, Free Assembly & Local Service too! The Best Quality Vacuums In The Triangle...and beyond! Miele vacuum cleaners - including Miele upright vacuums, Miele C1 canister vacuums, Miele C2 canister vacuums, Miele C2 canister vacuums. Thanks for visiting Capital Vacuum! Stores in Raleigh and Cary. 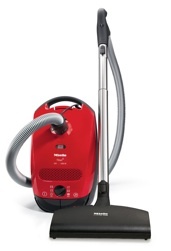 Miele Vacuum Sales, Service, Repair & Supplies. We are your exclusive Miele Vacuum Cleaner dealer with stores in Raleigh and Cary, NC. Miele German vacuum cleaners are among the very best vacuum cleaners. These top vacuum cleaners include the Miele Vacuum U1 uprights, Miele C2 canisters, Miele canisters, Miele Vacuum C2 canisters, Miele Vacuum C3 and Miele brooms. We service all Miele vacuum cleaners. We have Miele vacuum cleaner bags, Miele vacuum cleaner filters, Miele vacuum cleaner supplies, Miele vacuum cleaner hoses, Miele belts, Miele parts. 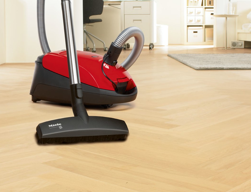 If you want the best, choose a Miele vacuum cleaner from Capital Vacuum Floor-Care World!